Join us for a day of learning and experiencing at Butterbee Farm! Participants will soak up knowledge from ASCFG President Dave Dowling, florist and business owner Ellen Frost of Local Color Flowers, special guest farmer and designer Julio Freitas of The Flower Hat in Bozeman, Montana, and Butterbee farmer Laura Beth Resnick. Blooms and Bouquets is a flower farming intensive; aspiring farmers, beginning and experienced farmers, and farmer-florists are welcome. Plan to arrive at the farm between 7:30 and 8 am and leave between 5 and 5:30 pm. See below for a complete schedule of events, speaker biographies, and kind words about previous Blooms and Bouquets. This is an adults-only class. Please leave your kiddos at home! Refunds may be given up to one week before the class for physical issues or family emergency. We limit class participance, so please be fairly sure you can come before registering! -There's nothing more helpful or re-energizing in the midst of July burn-out than getting to talk shop with your flower growing heroes! 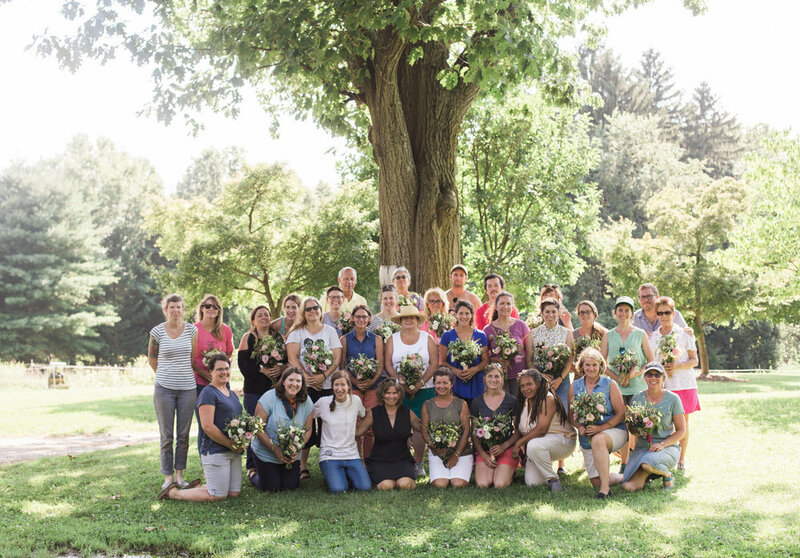 Blooms and Bouquets brings together excellent presenters and a diverse group of growers with just the right ratio of structured workshops and presentations to social time for mingling and networking. -I am so glad I attended the Blooms and Bouquets workshop. You cannot put a price on seeing another farmer's operation from the inside. Laura Beth's openness and willingness to share information were invaluable. -No exaggeration -- Blooms and Bouquets set me on the road to becoming a flower farmer. -This was a wonderful workshop! So much information was shared by new and established flower farmers, I went away with my head spinning. And the design portion of the workshop gave me more ideas and tips for planning and executing a wedding. A really nice day! -A really good workshop with professionals who are really living and breathing what they talk about. Laura Beth energy is contagious and I walked away thinking that focusing on the blooms was far more important than obsessing about a weed-free field. Liberating! -I loved each session of the day, and learned so much from each teacher and just seeing Butterbee farm in July. Laura Beth is so open with everything about her business - the good, the ugly, the nitty-gritty details - which is something you can't get from a reading a book! Well worth my time to take a day off in July. I was inspired to hit the (financial) books and get my fall crops in the ground! Ellen Frost is the owner of the floral design studio Local Color Flowers in Baltimore, Maryland. Mrs. Frost has been leading the change for local flowers since 2008. Her company sources all of their flowers, foliage, branches, and plants from farms within 100 miles of Baltimore. In 2016, she was given the Allan Armitage Award for Outstanding Leadership from the ASCFG. Dave Dowling grew cut flowers in Montgomery County, MD for 20 years. He served as the Mid-Atlantic Regional Director of the Association of Specialty Cut Flower Growers (ASCFG) from 2002-2004, and served as president from 2006-2009. He was the Industry Liaison from 2014-2015, and is again currently president of the ASCFG. With field, high tunnel, and greenhouse production, Farmhouse Flowers & Plants produced cut flowers year round. Most of the flowers raised were sold at farmers markets, including two year round markets in the Washington, DC area. Flowers were sold direct to florists from Baltimore to Washington, DC through Capital Flower Growers, LLC, a cooperative formed with two other flower growers in 2013. Early in 2014, Dave closed his cut flower business and began working at Ednie Flower Bulb, which is now a division of Fred C Gloeckner & Co. He keeps busy as a sales rep and advisor to cut flower growers across the country with small to medium sized farmers. Dave also oversees the warehouse/shipping department at Ednie. Laura Beth Resnick is the founder and manager of Butterbee Farm, a two acre flower farm just outside of Baltimore City. Butterbee Farm flowers are for florists, weddings, and CSA members; the farm is also home to classes and workshops. Before she was a farmer, Laura Beth went to music school to study flute performance, which prepared her well for entrepreneurship. 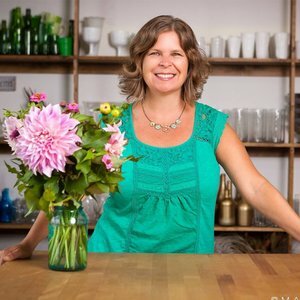 Laura Beth is a Trainer through the Beginning Farmer Training Program with Future Harvest CASA, and President of the Maryland Cut Flower Growers Association. She has taught numerous workshops and is a speaker on the subjects of crop planning and business relationships at regional and national farming conferences. Julio Freitas is a flower farmer and floral designer located in Bozeman, Montana, where he operates The Flower Hat. With work featured in Harper's Bazaar, Elle Decor, Magnolia Rouge, Flower Magazine, Style Me Pretty and many others, Julio credits his successful career to his unique style of floral design that incorporates locally grown flowers and foraged botanical elements.